Suffering from chronic pain can make even the calmest person angry. However you have the power to change that and that power is all in your mind. We've all been there right? Your back is killing you and you're in a foul mood. You feel so angry and frustrated ​that you just want to scream. And this anger is understandable. However if you do feel angry regularly because of your back pain then you really need to do something about it. Because getting angry will only make your back pain worse. And it can also affect your close relationships with your friends and family. So try out incorporating these 3 anger management strategies into your ways of thinking. As it'll not only help you to lower your pain levels, it'll also make you feel better and become a lot more ​pleasant to be around! Why Does Chronic Back Pain Make You Angry? Can Accepting Your Pain Really Help? ​The idea that being in constant pain will make you angry seems pretty obvious right? I mean it's not just pain in your back is it? It's also a massive pain in the arse! ​So it's no surprise that anger is an emotion that is so common among people with chronic lower back pain. ​But the thing is it's not just the physical pain that makes you angry. For instance, you can get frustrated when you feel you can't do the things you want to do in life because of your pain. Anger and resentment can also build if you blame other people or circumstances for causing your pain. Then there is the injustice of it all. So it's easy to get the hump and think 'Why the hell do I have to deal with this sh.... struggle every day?'. Especially when it seems everyone else is fine and dandy. Because studies have shown that by becoming angry you are highly likely to increase the levels of back pain​ that you feel. ​And by becoming angry you can make life a misery for your close friends and family. ​Because being in a supportive relationship has been shown to be great for the long-term well-being and quality of life of a person with chronic pain. So we really need to nip this anger in the bud if we are going to fight back against chronic back pain. The good news however is that ​there are 3 proven anger management strategies you can use that can stop this anger before it develops. Reconstructing how you think about your pain experience. Learning to accept the pain you feel rather than fighting against it. Distracting your attention away from the pain. But don’t worry these aren't complicated therapies or techniques. They are just simple shifts in thinking that anyone can do. ​'Putting on your reconstruction hard hat' is a term I use to describe the process of changing your thought processes by using Cognitive Behavioural Therapy (CBT) techniques. Relax, this isn’t as scary as it sounds! It's simply a process of identifying negative thought processes about pain that cause you to become angry​, challenging them with logic and then reconstructing them in a more positive way. The idea behind CBT is that emotional and behavioural problems begin in the mind. So basically it's your negative thoughts, beliefs and attitudes that are the main cause of your emotional distress and unhealthy behaviours. The problem ​is that a lot of the time these thoughts and beliefs are not accurate. Now we all share beliefs about pain that we learn as we grow up​. For instance we learn that feeling pain is a sign of immediate danger that needs addressing straight away. However this is not the case when your pain becomes chronic. ​Because chronic pain is just there. And in the vast majority of cases it's not a sign of immediate danger that you need to deal with straight away. But because our brains are so programmed to respond automatically to all pain as urgent it can interpret chronic pain as being far more significant than it actually is. Have catastrophic thoughts where you always imagine a 'worst-case scenario' for the pain you are feeling no matter how unlikely this is. Overgeneralise when thinking about your pain which can lead to you not taking care of yourself (For instance: "I've tried everything to fix my pain and nothing has worked so what's the point in trying something new?"). Let your pain become your sole focus which leaves you unable to recognise or appreciate the good things in your life. ​These thoughts are all unhealthy and will only result in making you feel angry and helpless. So the aim of CBT is to replace these harmful and inaccurate thoughts with positive ones that more accurately describe the situation. And by doing this you will develop a more positive attitude which will allow you to better manage your chronic pain and gain control over the levels of pain that you feel. CBT is a great way to do this as it has been shown in studies to be a good way of reducing anger. For instance an analysis of 50 studies of people with anger issues found that those that had CBT treatment did better at reducing their anger levels than 76% of the untreated patients. Identifying the negative thoughts, beliefs and attitudes that you hold about your pain. Challenging these thoughts using evidence and logic to see how true they are. Using the evidence to reconstruct (reframe) these thoughts in a more positive and accurate way. Negative thinking can leave you feeling trapped and helpless when it comes to living with your chronic pain. And this is a major cause of anger and frustration. So next time you are feeling angry and in pain try to identify your thought processes. This can be quite difficult to do. As these negative thoughts can be hard to pinpoint and when they have become automatic you probably won't even realise that they are there. So a great way to do this is by keeping a pain diary. For a couple of weeks write down both your anger and pain levels at four set intervals during each day. And alongside each entry also make a note of what you were doing at the time. What was happening around you? What were you thinking about? How were you feeling? Over the weeks this is a great way of becoming aware of the thoughts and feelings​ that may remain invisible to you if you don't consciously try to observe them. And these are the thoughts you need to change if they are causing you to be angry. So hopefully after a couple of weeks you will have a list of these thoughts in your diary and an idea of the beliefs and attitudes ​towards pain that are holding you back. And once you are aware of them you can then look at them in more detail to see just how accurately they represent your pain situation. Also keeping a pain diary comes with added benefits. As it makes you aware of events and situations that trigger your pain and anger which you can then think about changing or avoiding. And writing down how you feel is also a positive way to release any anger and frustration you are holding. For instance, one study found that chronic pain patients that kept a pain journal over a 9 week period had far greater control over their pain and anger levels than those that didn’t (11). So keeping a pain journal seems a pretty good starting point for identifying negative thought processes to me. Unfortunately you can’t stop negative thoughts from occurring especially those about pain. However you can learn to disrupt and challenge them. ​Because you'd be surprised at how often your brain tricks you into thinking things that​ are simply not true. Which gives you a skewed outlook and can make things like your pain experience seem far worse​ than it actually is. But by gradually retraining your mind to think differently about pain you can get a more accurate and positive picture. And this will leave you feeling more hopeful and in control rather than getting angry and frustrated. Now to challenge negative thoughts you need to use evidence that disproves them. Therefore the more knowledge you have about your chronic pain experience the easier it is to challenge them. So knowledge is power here. And the good news is that you’ve already made a start without realising it! Because by reading through chronic pain websites like this one, Facebook groups and forums you will begin to form a greater understanding of what living with chronic pain actually means. And also what it doesn't. Which will highlight just how unlikely and irrational many of your thought processes about pain are. ​So it's all about educating yourself so you can shoot your brain down when it tries to tell you that the pain in your back is an impending disaster. As chronic pain can be an isolating illness. However these forums can be a source of inspiration, support and community as they give you access to hundreds of people going through similar experiences to you every day. So not only can they help you to increase your understanding of your own problem. They are also great places to learn new ways of coping through the experiences of others. Plus they are a source of support and encouragement that you may lack at times in your day-to-day life. So now you have a list of negative thoughts from your pain diary and have educated yourself on chronic pain you are ready for the final stage. Which is reframing these negative thoughts as more positive​ ones. These coping statements are more positive and accurate ways of thinking about pain than the negative thoughts you are having. I'll give you examples of 3 very common types of negative thoughts which are false beliefs, feeling sorry for yourself and catastrophic thinking. ​Now having this thought going over and over in your mind is only going to make you feel helpless, angry and frustrated. But look at it closely. Is it really true? ​I mean think of all the times in the past when your pain has been at the same level (or worse) yet you still managed to survive. When you look at it like this it doesn't stand up to scrutiny. ‘I’ve coped with this level of pain before and it always gets better eventually. I’ll cope today as well’. With this thought in your mind you are now far more in control than before and less likely to get angry. Now dealing with chronic pain is awful. But thinking along those lines is only going to make you angry and resentful. And when you think about are you REALLY the only one struggling? ​Just that simple shift will stop you feeling helpless, angry and alone. ​So do you see the idea here? The first thought in each of these examples would create anger and frustration at the pain and leave you feeling helpless. But the coping statement you replace it with would lead to a more positive and hopeful frame of mind and a greater sense of control over your life. And this is the change we are looking for with CBT. While challenging negative thoughts is good, changing habits is a difficult process. This is especially the case with thought processes that may have become automatic. So for this change in thinking to occur you need to keep at it. As positive coping statements need to be repeated over and over to become automatic in your mind and override the negative thoughts. And my favourite technique that can help with this process is with the use of flash cards. Do this for each different negative thought about your pain that you can identify. Then keep the set of cards handy and read through them each time you are feeling in pain and angry. Through repetition these coping thoughts will gradually become ingrained in your mind as a counter to the negative thoughts. And this will not only lessen the impact of your negative thoughts it might even replace them altogether. So by becoming aware of negative thoughts and attitudes, challenging and reconstructing them in a more positive way you can gain more control over your pain experience. 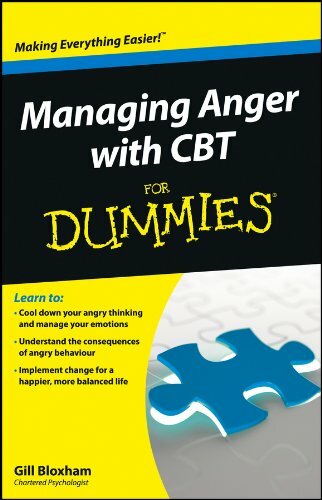 If you are curious to discover these techniques in more depth a good book to buy as a starting point is 'Managing Anger With CBT For Dummies'. CBT methods that aim to control negative thoughts by reconstructing them have been effective for reducing anger. However there is an alternative method that has also proved effective. And that is to learn to accept your pain. Now this may appear to go against the whole 'fight back against back pain' motto that this site is based on. But it's all about fighting a smart fight. And constantly struggling and picking battles that you can't win are only going to make your back problems worse​. So Acceptance and Commitment Therapy (to give it it's formal name) focuses on accepting your negative thoughts and pain rather than struggling to control them. Which can help as constantly struggling against your thoughts can cause you long-term emotional and physical distress. And this approach has been shown in various studies to lower anger and increase the quality of life for people with chronic pain​. Now like CBT the acceptance approach also aims to reduce the effects that negative thoughts have on your behaviour. But rather than reframing these negative thoughts, you instead learn to accept that you will experience pain and that negative thoughts will automatically come with it. And by accepting that these thoughts will come you are aware of them but choose not to engage them. Which means they have little to no impact and don't get in the way of the things you want to do. ​Acceptance of pain and negative thoughts sounds great in theory. However it can also seem to be easier said than done at first. Because we all know how much chronic pain can disrupt our lives. But to live a fulfilling and satisfying life you need to be able to work towards goals that are important to you. And there is some evidence that by accepting pain rather than trying to reduce or control it you can continue with the activities you enjoy despite being in pain. For example one study tested the performance of people with chronic lower back pain over 7 different physical tasks. And the group that were using pain acceptance strategies showed a 16% improvement in their performance. However the other group that only used pain control strategies showed an 8% decrease in their performance. So the people with back pain who used pain acceptance strategies had a higher tolerance for pain and were better able to carry on with their activities. In other words, acceptance methods may be better at keeping you active. For instance, how many times do you put things off that are important to you just because you think the pain will be too much to bear? This could be anything from attending a friend’s wedding, spending time outdoors with your family, pursuing a hobby or taking an adventurous holiday. So if you could learn to accept the fact that you will feel pain but without allowing it to stop you wouldn’t that be a great thing? This is what the acceptance method is all about. Now this takes a bit of mental practice, awareness and flexibility to accomplish. ​I've already briefly covered the idea of acceptance when it comes to the pain you feel. But accepting your negative thoughts doesn’t mean giving in to them. It doesn’t mean allowing them to reduce you to an angry, self-pitying, individual. And it doesn’t mean allowing them to influence your behaviour or leave you feeling helpless. What it means is observing the thought, allowing it to occur, but keeping a distance from it and allowing it to pass. Because thoughts come and go. So while negative thoughts are natural and you will never going to be free of them. By accepting that these painful thoughts will occur along with your pain you can greatly reduce their impact. And by doing this you can eliminate the struggle against pain and reduce the anger and frustration that comes with it. Another good way of standing back and distancing yourself from negative thoughts is through being mindful. As mindfulness is the practice of being present in the moment. So it's about being aware of what is happening in every moment but just allowing it to be without making any judgements on it. This allows you to step away from your pain and view it from the outside rather than allowing it to overwhelm you. And this can give you a more balanced relationship with your pain rather than reacting to it in a negative way which only causes anger and further pain. Now the effectiveness of mindfulness to the acceptance method has been shown in various studies. For instance one study found that a group of people with chronic pain that practiced mindfulness were more able to accept their pain than another group that were treated with physiotherapy and medication alone. 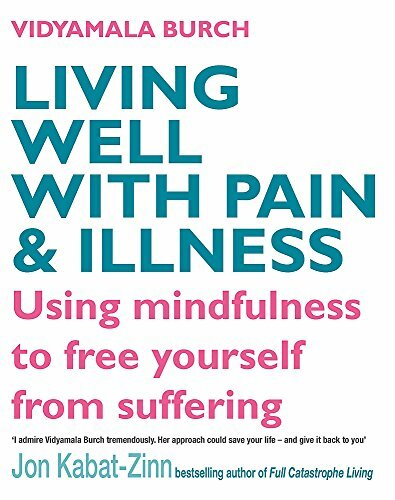 So being mindful can really help you to accept your pain experience. Now mindfulness takes a bit of practice and isn't the easiest thing to learn on your own. And downloading this app to your phone is a great way to make mindfulness a regular part of your life. ​This is a great introduction to meditation and mindfulness for people with chronic pain. And the best part is that it is written by someone who has been living with chronic pain for over 30 years. But all in all while being present in the moment takes a lot of practice keep at it because the benefits are definitely worth the effort. So now you have learned some techniques on how to accept that pain and negative thoughts will happen. But how does that help when you are having a bad pain day? I mean when everything feels like a massive struggle how can you distance yourself and carry on regardless? You’re right it’s not easy. But the acceptance method is based on the thinking that if the activity you are doing or want to do is important enough to you then this will override your pain and negative thinking. ​Sounds a bit far-fetched? Well let’s take endurance athletes as an example. The pain comes with the territory for these guys and girls. Say someone is running a marathon, cycling in the Tour de France or swimming the channel. They are constant pain after a certain point. Every fibre in their body is screaming at them to stop. So why do they keep going? How do they keep going?! Because they know that the pain is coming and they accept it when it arrives. But they don't give in to it. Instead they focus on the important goal that they want to achieve. And this goal is so important to them that they don't give in to the pain. So while they expect the pain to come and they know it’s going to be there. The importance of the goal overrides the pain that their body is feeling. They are aware of the pain but they are not allowing it to be their main focus or to affect their behaviour. Because if for just one second they give in to the demands of the pain they are finished. But you can use this principle to keep you motivated to keep doing the everyday activities that are important to you. To do this you need to work out what is really important for you and it helps if you can define your life goals. How do you want your life to look in 5, 10, 15 years time? ​Yes I know this is getting pretty deep! But by doing this you can work out what you need to give your life meaning and purpose. And once these life goals are in place your day-to-day activities can be viewed as moving you another step closer to achieving them. This will help you to accept and tolerate the pain when you are attempting an everyday activity as you will be working towards something far greater. So for example if a life goal of yours is to be an active and fun grandparent then an afternoon in the park with the grandchildren will be easier to handle than if you think of it only in terms of how much pain you may feel on that day. Or if you want to master a second language with the aim of relocating abroad you can take on and handle the extra hours and commute to your Spanish class rather than cancelling due to expecting to feel more pain afterwards. I guess these are also general life skills. But having long-term goals will make it easier to accept your pain and conduct your day-to-day activities. And by doing this you are also focusing on the opportunities in everyday situations rather than feeling negative and self-pitying. Which will help you to stay more active, positive and in control of your life. Another technique you can try to stop yourself from getting angry about your pain is to distract yourself from it. This can be done by immersing yourself in another activity instead. ​But how does this work? In psychology it is said that your brain has a limited capacity processor for dealing with the sensory information around us. And we live in a world where our senses are being constantly bombarded. The sights, smells, and noises of life going on around us is overwhelming and it's more than we can possibly take in. This happens both consciously and unconsciously. Your brain will prioritise what it feels is the most important information to focus on. And when your body feels pain the brain has a tendency to mark this as the most important information. Because in most cases feeling pain means trouble of some sorts that you need to urgently attend to. But for chronic pain that’s not the case most of the time. So how can you stop these chronic pain signals from taking priority in your brain? One way is by consciously distracting your brain away from the pain by giving it something else to process instead. This fills your limited capacity processor in the brain to an extent where there is no room left for the pain signals to get through. And in this way you are able to lower the pain levels you feel and prevent the anger that comes from it. I mean have you ever noticed how sometimes you don’t notice your pain while at other times it's all you can think about? For me I notice that my pain tends to temporarily disappear from consciousness when I’m out socialising with friends. I barely ever notice the pain or if I do it becomes background noise rather than the main event. Well there’s too much going on at that moment for it to grab my attention. Another time this happens is when I’m absorbed at work. I lose myself in the painting, radio on in the background, time flies past and the pain doesn’t get a look in. Only later on the journey home does it say hello again. However if I have a lazy day sitting around at home I’m constantly aware of the nagging pain. With no distractions the pain signals take priority once more. So can you see the idea behind distraction? Doing a puzzle, jigsaw or crossword. Reading a great book with a glass of wine. The list is endless so experiment a bit and see what takes the pain away the most. And an added benefit of doing this is that indulging in activities that you enjoy will release endorphins. Which not only make you feel good but also work as the body's natural painkiller by blocking pain signals from reaching your brain. This will also help to improve your mood, relax you and reduce your anger levels. And if you feel happier it will have a positive effect on your pain levels too. Now scientific evidence for the effectiveness of distraction for people with chronic pain is still scarce at present. However one study did show that people with chronic lower back pain who used distraction techniques were able to last longer on an activity that produced pain than those that weren’t distracted. Which suggests that distraction meant it took longer for the pain to get through to their consciousness and upset their rhythym. So while distraction shouldn’t be seen as a solution it can be an effective coping strategy that is worth experimenting with. After all if you can find activities that you enjoy that also give you a few hours relief from your pain then that can’t be a bad thing right? ​So after reading through this article I hope you can see the danger of allowing chronic pain to make you angry. As it can become a vicious circle where being in pain can cause anger but becoming angry will only lead to you experiencing more pain. And this anger can also alienate family and friends leaving you without a support network that is vital for your well-being. So it's a problem that needs addressing. Luckily this can be done with the use of the 3 anger management techniques in this article. Firstly you can attempt to gain control over your pain by identifying negative thoughts and reconstructing them in a more rational and positive way. Alternatively you can learn to accept that pain and negative thoughts will be present but not allow them to affect or influence your behaviours or mood. And finally you can distract your brain away from the pain by indulging in activities that you enjoy instead. I hope that some of the techniques will prove helpful to you and anger from back pain will become a thing of the past. Good luck and let me know how you get on in the comments below. Graham, J. E., Lobel, M., Glass, P., & Lokshina, I. (2008). Effects of written anger expression in chronic pain patients: making meaning from pain.